Join the C&C Girls at the Zumba® party to raise funds for Cardiac Kids in Support of the Sick Kids Foundation. 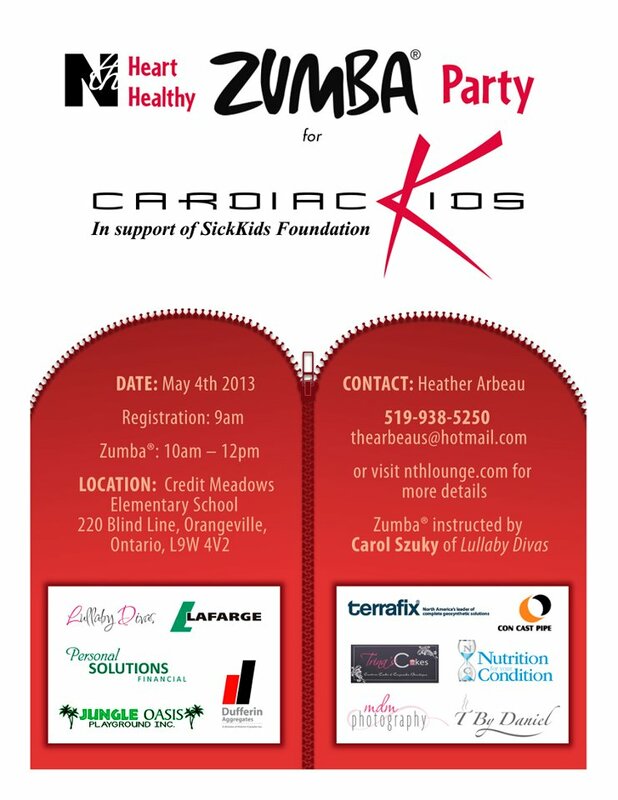 The incredible instructor Carol Szuky of Lullaby Divas will get your heart pumping in this 2hr Zumba® Party! Bring your friends and neighbours no experience required and prepare yourself for the most fun you've had while burning calories and making your heart strong. There's nothing like getting fit for a great cause! Contact Heather Arbeau at thearbeaus@hotmail.com or Michelle from Nth at michelle@nthlounge.com to purchase your ticket(s). Proceeds from Nth Heart Healthy Zumba® Party will go to Cardiac Kids: One in 100 babies born will have one of 35 known types of Congenital Heart Disease(CHD). Many children have several surgeries, procedures, transplants and some don’t make it. Having a son with CHD we have committed to raising awareness of Congenital Heart Defects.